GREAT COPY. 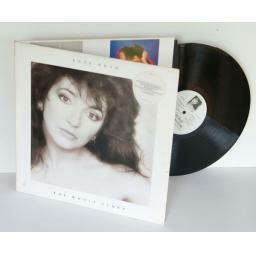 KATE BUSH the whole story. CONTAINS BBC BANNED SINGLE EXPERIMENT IV. First UK pressing, , townhouse matrix, 1986, on EMI records. Unlaminated gatefold sleeve WITH SPOT UV in excellent condition, the matt white is prone to storage marks and rubbing, THERE IS FAINT AGE DISCOLOURATION ON THE REAR SLEEVE The black inner is in excellent condition. Vinyl IS IN EXCELLENT CONDITION, plays beautifully, minimal spindle marks and some marks on vinyl, they do not effect play, The photograph on the listing is this copy. I only sell albums that are in very good to near new condition. I do not sell records with writing or labels on them or records that are warped or jump. All records will be posted with extra card stiffeners. If you feel the album is not as described I will give a full refund. KATE BUSH, Hounds of Love.